Thursday evening I had the pleasure of bringing Tessa, Duchess, Cha Chi, and Holly back from Perry. Nona and Melissa had picked them up at the prison in Quincy, Florida that morning and drove them to Perry to meet me at Priester's for the hand off (thanks again guys!). What a great bunch of dogs! They sleep the entire way back and not a peep was heard from anyone! Just perfect behavior! I have to say this is my first time fostering one of the pups from the prison foster program and boy am I really impressed. I have Tessa who is smart as a whip. And cute, to boot!! We already have an applicant interested in adopting her so I don't imagine I'll have her for too long. Hearing about how wonderfully trained the prison pups are is a different beast than seeing it first hand, I have to say and I am thoroughly enjoying Tessa and running her through the gammit of verbal commands that she knows. Makes me wish I could send my four there for training!! But alas, that is not possible. I have to live vicariously through the prison pups and dream that mine are that well trained!! Actually it gives me great incentive to work on training mine a bit more. They do know "sit" and "down" but that is about it. The command that I most appreciate that the prison pups know is "stay". 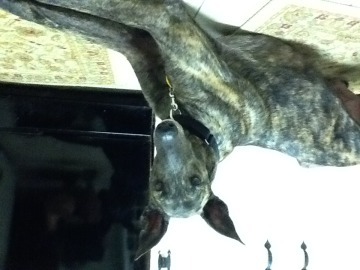 The "stay" command is always a command and behavior that is beneficial for any dog to know, especially Greyhounds. This is something I've tried to teach my own, but it's not quite sunk in with them yet mainly because they think they must always be by my side! They also learn "drop", "kennel up", "hurry", "come", and a host of other commands. All are fantastic for them to know!! And its way fun for the handler, too! I do believe my dogs are jealous when they see the things that Tessa can do. Perhaps it will rub off on them before she goes to her forever home!! I can dream, can't I?